When I re-organized my HDD, one of my vague plans was to take another look at both Black Desert and Elder Scrolls Online. They each have settings that I find visually appealing and to some extent I enjoyed the relatively brief times I spent exploring their worlds. Of the two, I liked BDO a lot more. 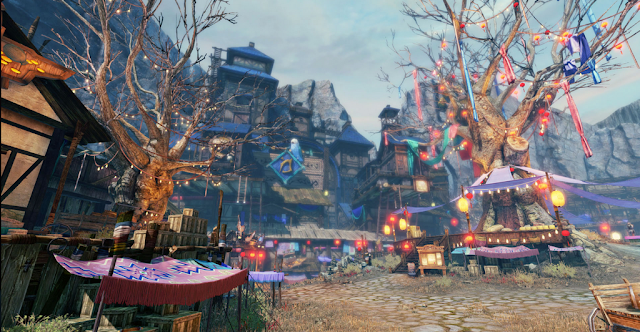 The lore may be considerably less developed and the mechanics significantly more gamelike but it always felt much more like a "real" place to me. The various NPCs seemed, somehow, to be "there" in a way they don't in ESO. It was very easy to imagine life going on in without me in Calpheon or Valencia, whereas in Glenumbra or Betnikh I felt more as if I was walking around a historical re-enactment. It was as though the NPCs were all actors, who'd heave a sigh of relief when I logged out because it meant they could slip back into their everyday clothes and go home. The overriding reason I enjoyed BDO more, though, was the mechanics. Both games use a form of mouse-locked, reticule-aimed action combat but in Black Desert that results in a wild, freewheeling romp whereas in ESO it's a jarring, discordant lurch. Black Desert also benefitted strongly from having excellent personal housing. Property there is plentiful, inexpensive and appealing. The way you can open the windows of your home to look out and see other players passing by, even though your house is instanced, seems more magical than the actual magic in the game. As I posted, when I'd patched up BDO and recovered my login details, the first thing I did was go back to my house in the hills. I was surprised to find I immediately remembered the way and delighted that everything there was exactly as I'd left it. When I think about persistence in MMORPGs I suppose this is the kind of thing I have in mind. I'm not quite in Syp's class in believing that all MMOs should have personal housing but I do believe it acts as a very powerful incentive to retention. For that reason alone I find it strange that any developer would resist having it in their game, the way both Blizzard and ArenaNet seem determined to do. When I briefly played ESO it didn't have housing but it wasn't long before ZeniMax added it to their increasingly impressive offer. I'd read a few things about it that made it sound a bit insipid but I wanted to take a look for myself. Once I'd got the game running and my account working - no short process - I logged in and went to look for somewehere to live. Okay, that's not strictly accurate. What I really did was log sraight out again and go searching for Add Ons. I'm the kind of player that generally doesn't bother with third-party programmes for MMOs. I prefer to use the default UI, wherever possible. In ESO it's not. If you stuck with the defaults you'd never know where you were going, what you were doing or how you were meant to do it. You most likely wouldn't even know what it was that you'd done after you'd done it. Even with Add Ons giving me a mini-map, an on-screen quest journal, visible hot bars and an inventory with visual iconography I still didn't really know what I was doing. I managed almost two levels and an entire solo dungeon using only auto-attack because I had no idea where any of my weapon skills were or, indeed, if I was meant to have any. Eventually I got that sorted out, which made killing things about two orders of magnitude faster and easier, at which point, naturally, I decided to stop the slaughter to go look for a house. 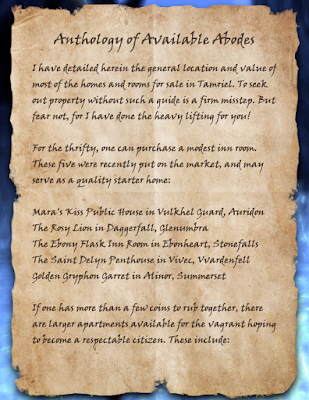 I'd picked up a quest somewhere that wanted me to go to Daggerfall and speak to someone about an Inn room. I was already in Daggerfall so that seemed like the place to start. You're really not selling it, Felande. Whoever wrote the quest dialog for "Room to Spare" must have had their tongue stuck in their cheek so hard it probably left a permanent mark. The whole thing's so arch you could run a railway over it. 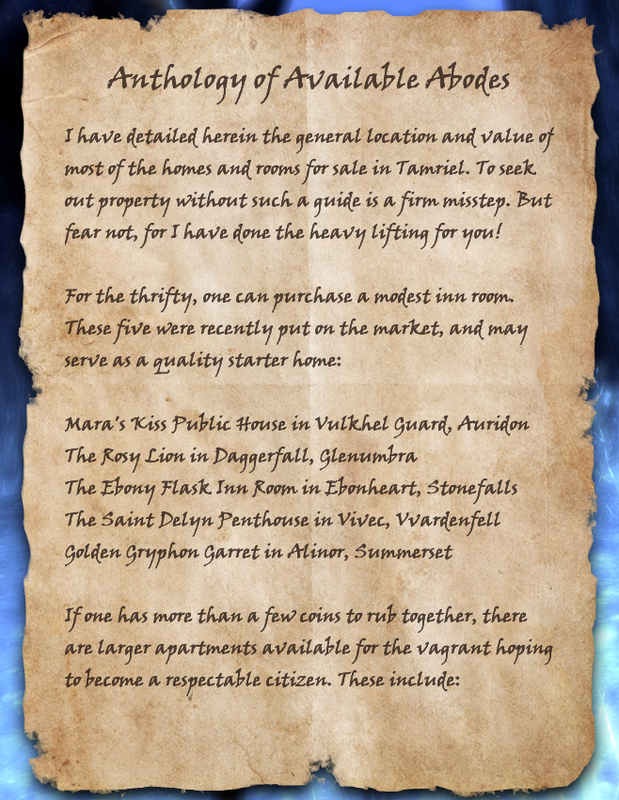 The conceit is that having an adventurer staying at the Inn confers such status it's worth letting the room out for free. The landlady, Felande Demarie, somehow manages to smirk and wink her way through the entire catalog of things you, the player character, can and can't do in your room, including setting up crafting stations, displaying your trophies, housing your assistants and even stabling your mounts, without ever quite breaking the fourth wall. It sounded like an awful lot to be going on in any Inn room but, when she finally let me see the room she was offering, I began to doubt her sanity. It was, without any question whatsoever, the smallest in-game accomodation I have ever seen. If it was any smaller you'd have to call it a cell. 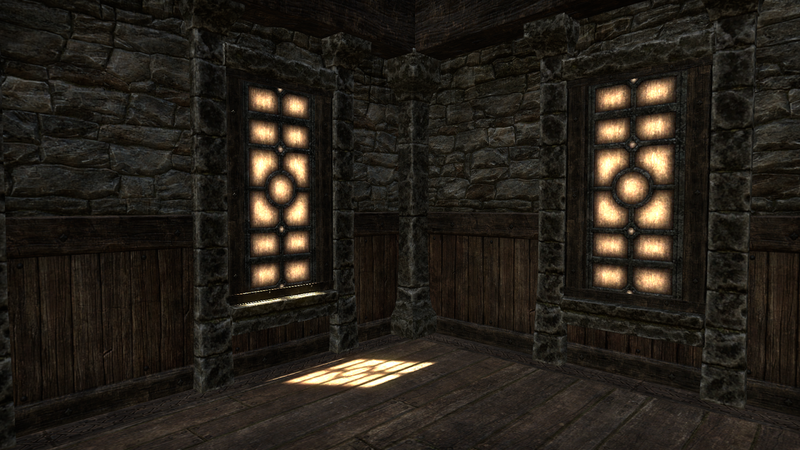 It's so tiny it makes the original single-room accomodation in 2004's EverQuest II look like a penthouse suite! It also comes with no furnishings at all. None. Nada. Unless you count a single, guttering candle on the floor, which I do not. I stood there, gawping at my new home in dumbfounded amazement. I couldn't even get enough distance to take a screenshot that showed more than one corner at a time. Felande had made a point of telling me the room was too small to permit dueling. She's not kidding! You couldn't swing a rat in there, let alone a greatsword. Monastic, I believe the term is. You would think a bed would come as standard in an Inn room. I mean, I've stayed in all kinds of places, from five-star hotels to the box rooms of private houses, but never have I paid money to stay anywhere that didn't come with some kind of bed. Not in MMOland. There you get neither bed nor breakfast unless you bring your own. So off I went to do some research on furniture. It seems you can buy the basics - the very basics - from NPC vendors, one of whom plies her trade out of the very same Rosy Lion Inn where I'm now living. You can also quest for a few things and you can either take up carpentry and make furniture or buy it from those who did. It's motivating. I like furnishing rooms. 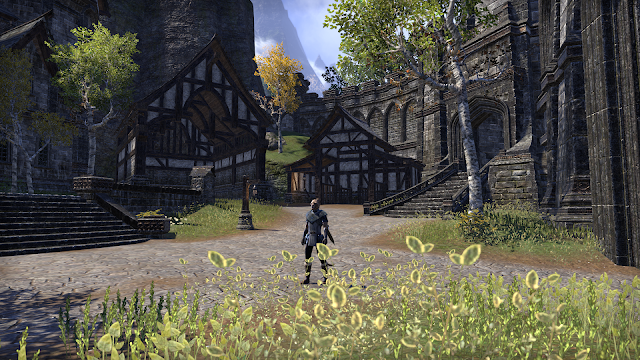 I certainly like it a lot more than I like following ESO's so far unengaging main storyline or enrolling in the seemingly endless series of dour, downbeat, depressing side-quests and regional narratives that pepper the otherwise charming cities, towns, villages and farmland. 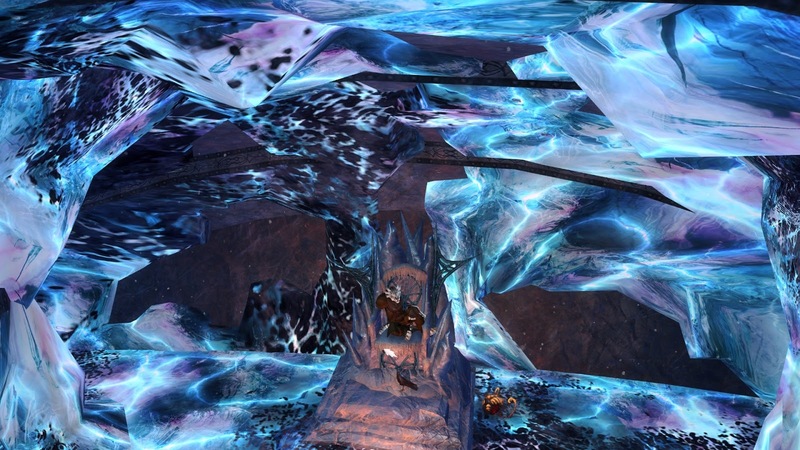 ESO has received some considerable praise for its quest writing. I quickly worked out why back when I was playing before: the people who praise it like it because it's just like the stuff you find in all those endless, by-the-yard, multi-volume fantasy epics. I think of the authors who churn them out as the literary equivalent of the kind of prog rock band that makes a living playing in the middle of the afternoon on the second stage on Sundays at festivals all over Europe, when everyone's either too stoned, too exhausted or too hungover to pay attention. I remembered that from last time but I hadn't really remembered just how stultifyingly bland the voice acting is. It's not that it's bad, per se. It's not like the astonishingly crass and inept voicework that EQ2 foisted on us a decade and a half ago, when that game promoted itself as the "first fully-voiced MMORPG". It's just flat, inert, lifeless and dull. It's so bleached of human feeling, in fact, that I found myself wondering whether whoever was directing the recording sessions actively forbade the voice actors to express an emotion. Any emotion. Given that these are clearly professionals, who understand the lines, it's very hard to imagine them throttling back so consistently unless their paycheck depended on it. After a few minutes I started skipping the spoken dialog. I can read the text in about a quarter of the time it takes the audio to play through so questing began to ressemble listening to FM radio while driving through a series of tunnels. Next time I think I'll switch the dialog off altogether, assuming there's an option for that. There will be a next time, though. 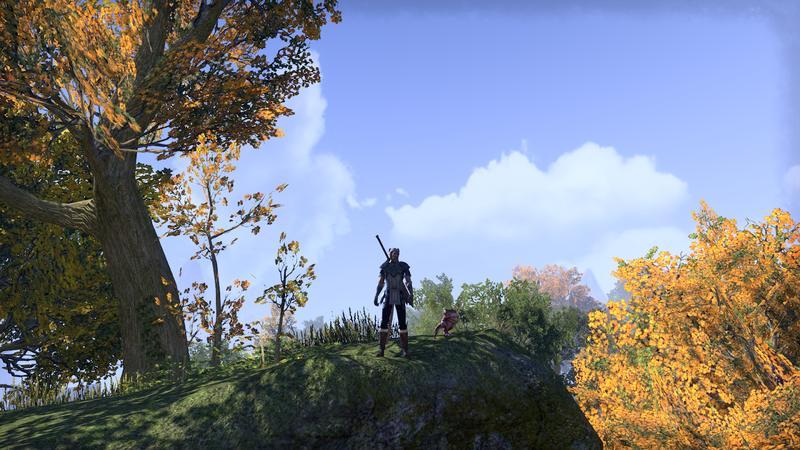 ESO's is a huge world and it seems one very well worth exploring. What's more, I have a home base now, and a prospectus of other places I could hang my hat. If I had a hat. Or a hat stand. Things are looking up. One of these days, maybe I'll even get myself a bed. 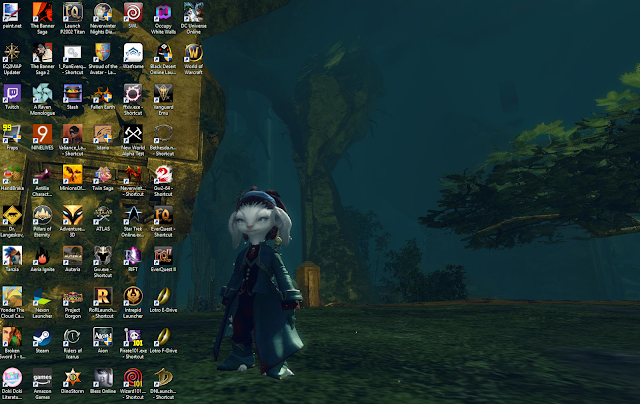 As Mailvatar noted in the comments to the previous post, I do have a lot of MMOs on my desktop right now. 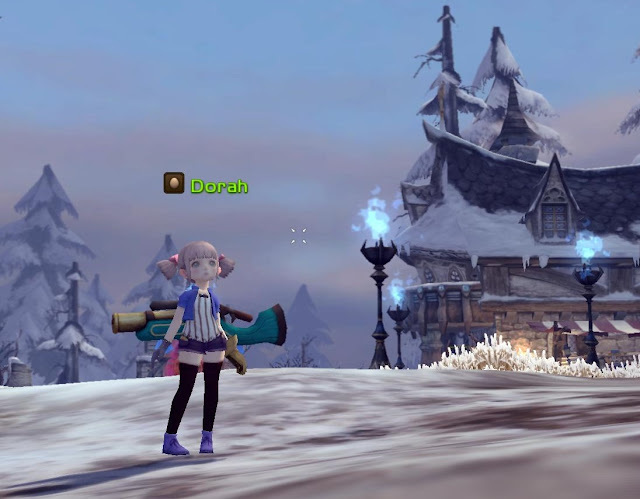 Can you ever have enough MMORPGs, though? That's the question. There's always room for one more, isn't there? A couple of days ago, MassivelyOP reported on a new one to me. I probably should have remembered it - they first featured it back in 2016 - but I didn't. It's yet another Eastern import, coming to us in here the West, this time, from South Korea. It's called Astellia, which is a perfectly functional, -if rather bland - name for what looks to be a standard Eastern take on Western fantasy. It also just happens to be the name chosen by "a leading provider of network and subscriber intelligence", whose website currently leads the Google search race. 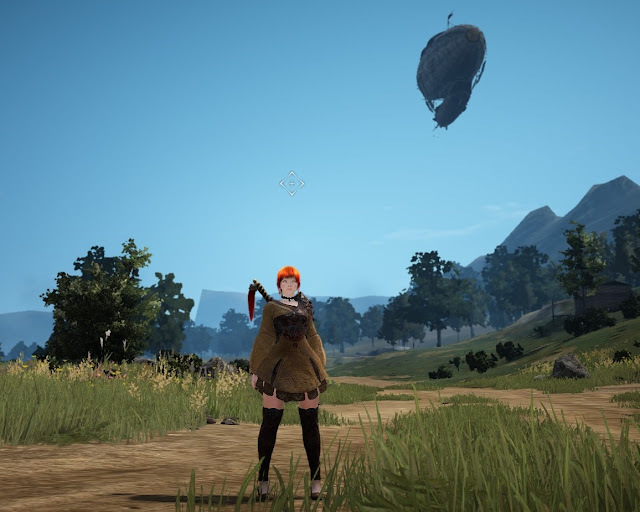 If the new MMORPG succeeds in emulating the success of another fairly recent import, Black Desert Online, those rankings could easily change. On the topic of BDO, while we're talking about it, I patched the game up the other day. I already had a full installation from a few months after the Western launch but to bring it up to date I had to download another 36GB. BDO has had a lot of "expansions" since I've been away. It is, by most reports, thriving. When I was finally able to log in I found my characters all still where I left them. I'd forgotten I had three. Multiple characters in a particular game is usually a sign that I'm enjoying myself. I did indeed find Black Desert quite compelling for a while. There's a non-trivial chance I'd find it so again but unfortunately my current installation appears to have a bug that's close to game-breaking: my keyboard doesn't work. When I got into the game I couldn't move or do anything. I stood there by the side of the road and watched horses and carriages pound past me. A giant airship cruised by overhead. I don't remember those being in the game when I last played. That thing's going to frighten the sheep. Some fiddling about via the Escape menu eventually got my WASD keys working but that was about it. I can run about and talk to NPCs but not much else. I remembered the way to my cliffside cottage, another indication that I'd been fairly invested in the game at one time. I made my way there and found it exactly as I'd left it. By this point I was quite keen to carry on playing so I did some research on the bug and tried a number of suggested fixes. None of them worked. If all else fails I can try a full re-install but I can't say I'm looking forward to it so chances are I'll let BDO lie fallow for a while longer. Anyway, right now I'm patching up Elder Scrolls Online, so I don't have the bandwidth. The ESO patcher doesn't tell me the full size of the download but I'm guessing it's huge because I've been at it for several hours and there's no sign of it stopping. Maybe it'll be ready for the weekend. I did succeed in getting Dragon Nest installed and patched. It seems to have changed hands yet again. I've lost count of how many different owners and publishers it's had. None of my several previous login IDs worked so I made a new account with the oddly-named Cherry Credits and started over from scratch, yet again. I think that's the fourth time - no, the fifth if I count the mobile version. Cherry Credits appears to be some kind of Singaporean portal for any number of games. Why I now have to go via Singapore to play a game called Dragon Nest EU beats me but Dragon Nest is worth any amount of hoop-jumping. I think it's probably fair to say it's one of my favorite MMORPGs of all time, now. Maybe one day I'll actually manage to get far enough to find out what's going on in the demented storyline. With all that re-installing and re-investing going on I probably don't need to be looking to new games to satisfy my craving for "novelty" but I am anyway. What caught my attention about Astellia was the producers' insistence that it's going to be "a Classical MMORPG striving to return the genre to its roots". Doubling down on that bold claim, in an interview with MOP, Astellia's Western publisher, Barunson (no, me neither...) goes on to predict that "Astellia is positioned to appeal to players who have enjoyed EverQuest, Guild Wars 2, and other content based MMORPGs". 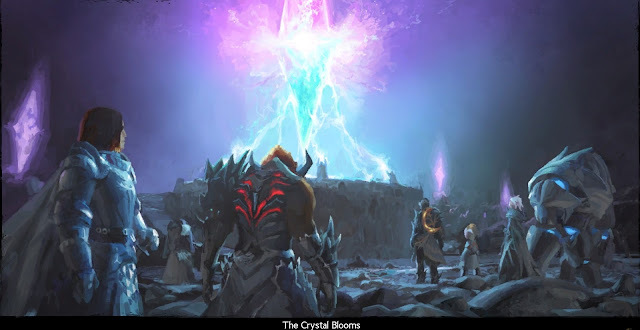 The game uses the modern version of the Holy Trinity (Tank, Healer, DPS) and has an old-school PvE/PvP split, with solo and group dungeons, instanced battlegrounds and large-scale, three faction realm versus realm PvPvE. That's quite a list of things I like, if only they're done the way I like them to be done. What's been somewhat harder to establish is how the controls work. Combat is tab-target but I have yet to ascertain for certain whether it's also hotbar-enabled in what we've learned to call "WoW Style". It doesn't necessarily follow but from this video it certainly looks as though there's a free mouse pointer in play. "I played a healer (it has defined roles) but found it really mediocre - its not horrible, but its also not anything groundbreaking or amazing. 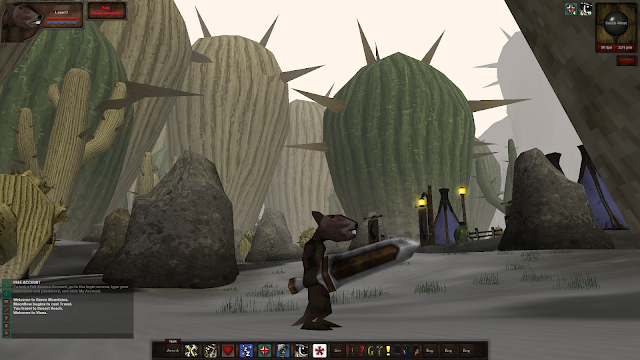 The questing is boring, its hub based - the game just feels like something that belongs in 2005." "The questing was really bad - kill stuff, pick plants - and always have to run back to the quest guy - no remote turn in - just a bunch of time wasted. The first mount comes in early - I think at level 7 or 8, but even with the mount I felt like I was moving really.... slow... back from one NPC to another to do these mindless quests. 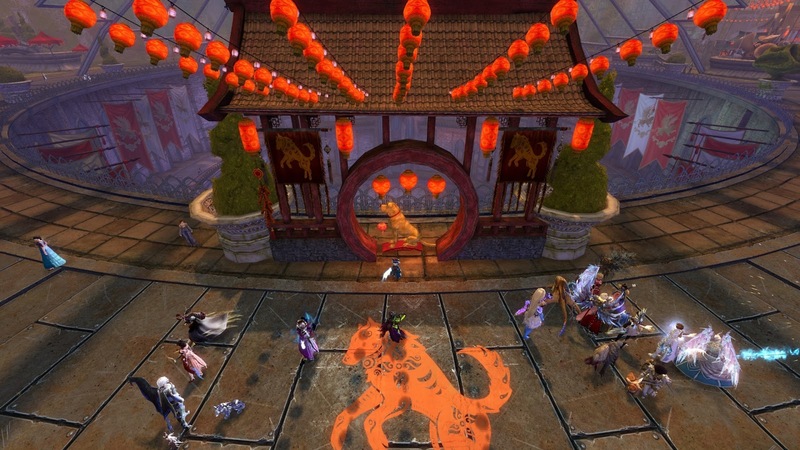 The game does have sort of an old-school feel to it but it's nowhere near as good as old school MMORPGs." Which is... kind of what I wanted to hear. Not the part about it being not as good as the games it professes to model itself on, obviously, but that it does, in fact, ressemble them to a significant degree. Something I found significantly more intriguing was this interview. It seems to have been Google-translated, which makes it for a highly, if unintentionally, amusing read but there are also some quite surprising revelations concerning the thoughts and intentions behind the game. "Q. The composition of the content looks like a game that requires patience, which should last a long time. I wonder how you look at the age group playing this game. Chung Hyun-tae, CEO: It aims to make sure that a game is convinced, and it is aimed internally and at the 30th and 40th user groups. Of course, it is said that the age group is the same for all ages." What this means (it's clarified later in the interview) is that the demographic targeted by the Korean developers is players in their thirties and forties but younger players might enjoy it anyway. The character visuals do play a little younger than the setting suggests but targeting an older audience makes quite a lot of sense when you consider the retro gameplay. Chung Hyun-tae goes on to say "I want to point out that if you were targeting users of 3:40, you are not focusing heavily on a niche market", by which I interpret him to mean that there are a lot of MMORPG players in that age bracket. And I think that's right. You just don't often hear MMORPG designers admit that their core audience is aging. Al this and I haven't even mentioned the title's USP, which is the eponymous "Astell Companion System", which consists of "Dozens of Astels to acquire, level, and build effective support teams that can combo directly with your character based on classes and skills". It's a collectible card game inside an MMORPG, essentially. I remain to be convinced how well that will work but it'll be something different to play around with and learn, which is always fun. All things considered, I'm not expecting much of Astellia. It's going to be a very odd duck, something of a hybrid throwback, combining WoW-clone era gameplay and design with relatively recent Eastern visuals. It's also likely to have a Buy-to-Play business model. They promise no "Pay to Win" and a relatively inocuous cash shop but we'll see. I'll probably buy it. I'm not so sure about the "play" part. Yesterday, sometime around five in the evening, "All or Nothing", the fifth episode in Guild Wars 2's fourth season of The Living World, went live. 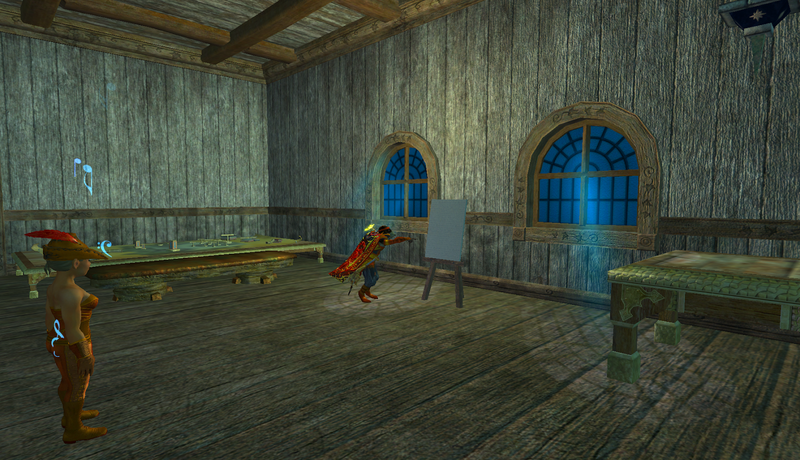 At the time I was playing EverQuest II. Later, I stopped to have tea. Then Mrs Bhagpuss and I watched something on iPlayer. It wasn't until around eight in the evening that I logged into GW2 to start the new chapter. By a quarter past eleven I'd finished it. I was still thinking about it when I went to bed. I dreamed about it in the night. I woke up thinking about it this morning. Mostly about the way it ended. There's not much I can say that isn't a spoiler. Nothing, really. I took plenty of screenshots, some of them excellent, but I can't use any of those either, especially not the best ones. 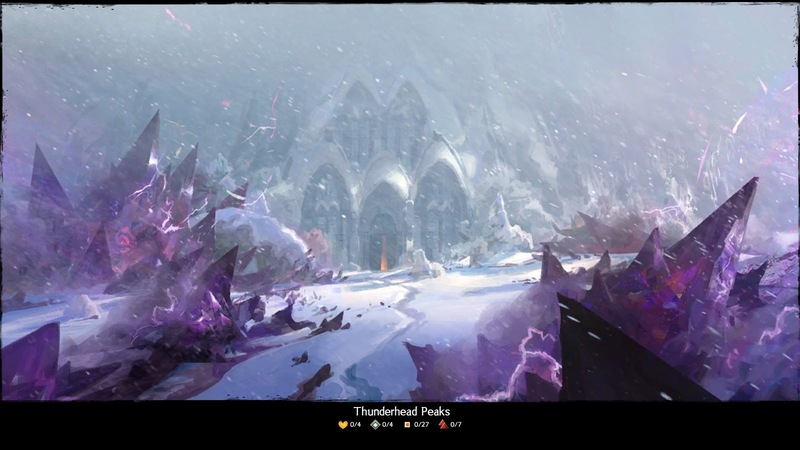 I guess I can talk about the new map, Thunderhead Peaks. I haven't really explored it yet, other than the parts that I needed to visit for the storyline. It's a very large, multi-layered area that sits above Desert Highlands. 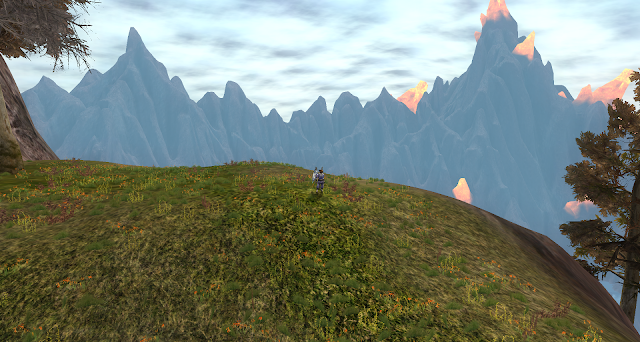 I think it's technically part of a region known as Deldrimor Front, which may or may not be part of The Shiverpeaks. It's a moot point. As yet it doesn't connect to anything else. Visually, Thunderhead Peaks is stunning. I found it difficult to resist running off in all directions to poke around the ruins, caves, tombs, mines and mountains. As I was working through the storyline there, banners flashed across my screen, announcing various stages of what I took to be the meta event chain. I declined to join in. Too busy. Too focused. Word on the meta isn't very positive, anyway, but I only found that out later. I'll reserve judgment until I've tried it for myself. The other big ticket item in the update is a new Fractal along with a lot of tweaks to that game mode. I don't do Fractals so I have nothing to say on that. There's also a new Epic weapon, something else I have no interest in, a new mount mastery that sounds marginally useful at best and an "Upgradeable Weapon Set" about which I know absolutely nothing. None of which matters in the least, not after that story episode. Which I really can't talk about. I suppose I could comment on how very, very short it is. That's not really a spoiler. Even by the long-established standards the Living World, this is blink-and-you'll-miss-it short. It took me barely three hours on a first run, when I had no idea what I was doing. Those three hours included at least thirty minutes of dithering and probably another ten or fifteen taking screenshots and generally gawking. Plus I spoke to every NPC that would talk back. Added to that, I do the Living World on my heal-specced Druid, who wishes he had the DPS of a limp dish-rag. I'd estimate that a second run, on a character with decent DPS, knowing where to go and what to do, would take no more than a couple of hours. And yet, I'm not complaining. One of the reasons All or Nothing is so short is that, finally and thankfully, almost all of the really pointless, timewasting filler has been removed. It's true that there is still a certain amount of repetition but the barefaced padding isn't quite as obvious as it used to be. The big fights were... ok, I guess. They didn't last forever. I was able to use my normal class abilities. Nothing made me want to throw my monitor out of the window. It's an improvement. I'll take it. So, now what? We wait three months for Episode Six? Or was that the finale of Season Four? Do we go all the way to late Summer, early Autumn and a third expansion that hasn't been officially announced or even unofficially hinted at? Which might not even exist? We're supposed to just carry on? As though nothing happened? Anyway, I can't discuss it so I'm going to shut up. And you know what? By the time it's all common knowledge and fair game for analysis and dissection and speculation we'll all have moved on and it will be too late. No-one will want to know. So I'll never get to discuss it. This is what I will say: it's the kind of thing that, the moment you've finished it, you want spend a whole evening talking about. Preferably in a bar, loudly, with hand gestures. And you know someone's going to cry and if someone else says the wrong thing then, friendships could end over it. Where does that leave us? Well, that's what we'd talk about, isn't it? We'd have to. We couldn't not. But we can't. So let's leave it at that. This is the post I planned to write yesterday, until my plans went awry and I ended up posting about how I don't plan ahead. You can see why. Leveling up my Bruiser in EverQuest II these past couple of weeks has been a journey. Actually, several journeys. 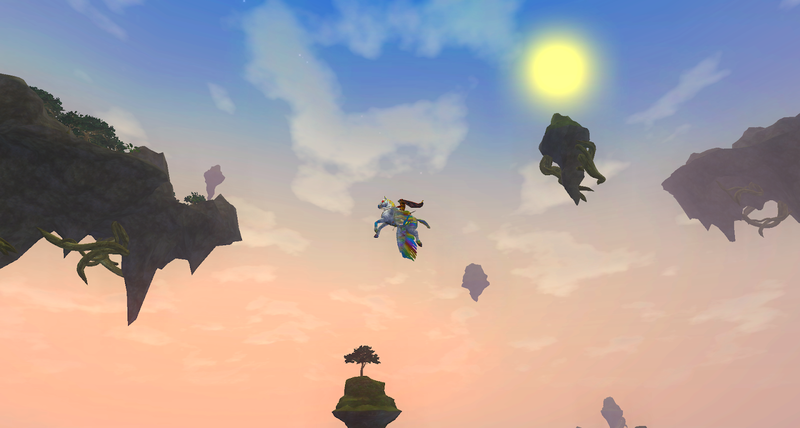 At around level 60 he started in Tenebrous Tangle, the beginner zone from 2006's Kingdom of Sky expansion. From there he moved on to Kylong Plains, the opening zone of 2007's Rise of Kunark. In doing so, he skipped an expansion entirely, Echoes of Faydwer. That too, almost unbelievably, also launched in 2006. I often refer to the glory days, when EverQuest routinely released two full, boxed expansions per calendar year. 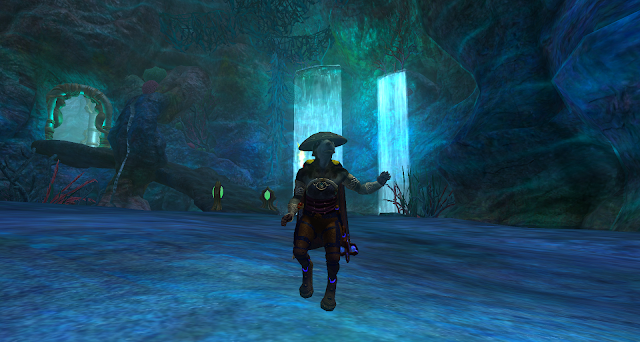 EQ2 never quite matched that astonishing production rate but between September 2005 and November 2007 the game received four boxed expansions, any of which was easily large enough by modern standards to merit release as a standalone MMORPG. For a while my Bruiser diligently followed the solo path the RoK designers intended. He scooped up all the quests at the dock - there are many - and finished them all. These opened quest hubs elsewhere in the zone. Some he happily cleared; others he began, then left hanging. He visited the zone's main city, Teren's Grasp and got his Sokokar mount, a big moment back in the day when we didn't all have flying mounts of our own. 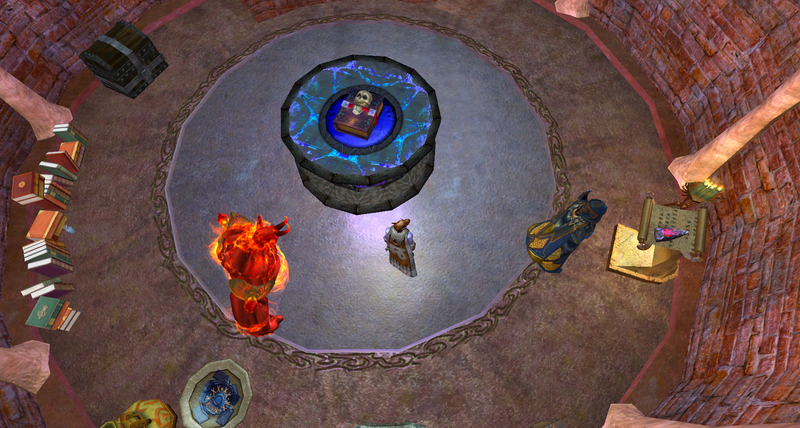 He ventured into the opening dungeon, Karnor's Castle, where he found someone else already soloing the heroic mobs once meant only for full groups. Didn't think to take any screenshots until much later. Here's one of the Bruiser posing in his fancy new raid gear. By the time he'd made it to RoK's sophomore zone, Fens of Nathsar, and completed the opening faction quests, everything was once again turning green. In search of that sweet xp spot that comes from questing just ahead of the expected curve, he moved on to 2010's Sentinel's Fate expansion. There he abandoned any pretense of following the plot. 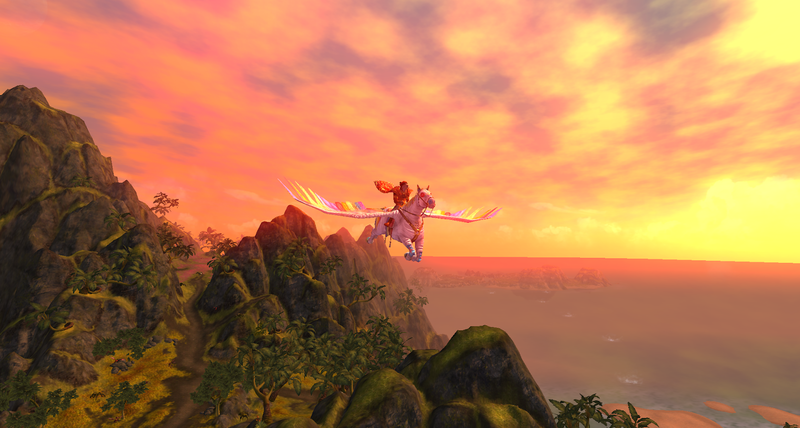 He flew around on his Patchwork Pegasus (a mount from a holiday event that allows anyone to fly long, long before the original level restriction of 86), swooping down to pick off named mobs as he saw them, cherry-picking a few, short quest chains I remembered with affection. When he'd had enough of that he moved on to 2011's Destiny of Velious expansion, passing over the opening zone to start in Eastern Wastes. He jumped straight into the quest chain involving the Ry'Gorr orcs and by the time he'd wrapped that up it was time to move on. At this point my Bruiser was at the very end of his eighties. Throughout the few brief sessions it had taken to get him there, experience had been coming so fast he'd barely scratched the surface of any of the expansions, which flicked past like the turning pages of a calendar in a 1940s movie. At around this point I paused for a rethink. While everything continued to be very easy, it was clear that the Mercenary was doing all of the heavy lifting. Since it looked very much as though the Bruiser was going to promote himself into the front ranks of regularly-played characters, I thought he should sort himself out. 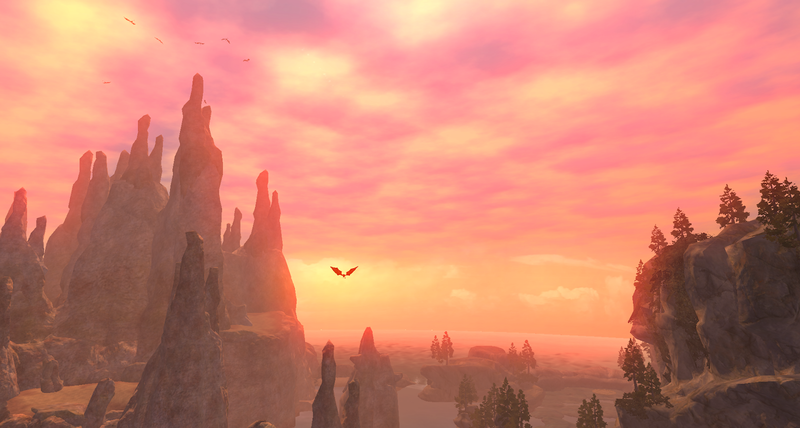 Cobalt Scar has spectacular sunrises and sunsets. I checked the broker for upgrades. To my surprise there were plenty of Masters in the right level range on sale at very reasonable prices. I bought all of them. Then I filled out the few gaps with Adepts. For a few hundred platinum his spellbook was suddenly up to date. Next I spent a while sorting out his AAs. I thought they'd been auto-allocating but they hadn't. He had around sixty unspent. That made a significant difference. Finally I took him to the bank. As a counterpoint to levelling I'd been taking my max-level berserker around some old raid dungeons; Fabled gear had been raining down on him and all of it was Heirloom tagged, meaning anyone on the account could use it. About half of it was Level 90, the rest 95. As soon as he hit 90 he slipped into his shiny raid gear and took the Griffon to Withered Lands. He'd already popped over in the late 80s, only to find that the minimum level to get quests was 90. Withered Lands is the Velious zone that was added between expansions to take characters from 90 to 92. It was an irritating period, when SoE decided to slow leveling to a crawl, so that doing one level took as long as five. Whatever code underpinned that design evidently persists. Xp did indeed slow down to a crawl. A relative crawl, that is. I remember completing Withering Lands when it was new. It has a long and meandering storyline and what feels like hundreds of quests. By "intrusion" Malra means "altrusitic response to our duplicitous pleas for help". And by "proper guest", Allura means "someone who can't resist our coercive mind-controlling powers". It took Mrs Bhagpuss and I, mostly duoing, several weeks to complete it all. My Bruiser knocked off a good chunk in a couple of days, taking him to 92. There was still plenty more to do there but at 92 he'd picked up the breadcrumb quest for what I believe to be one of the best zones in the game, Cobalt Scar, so off he went. 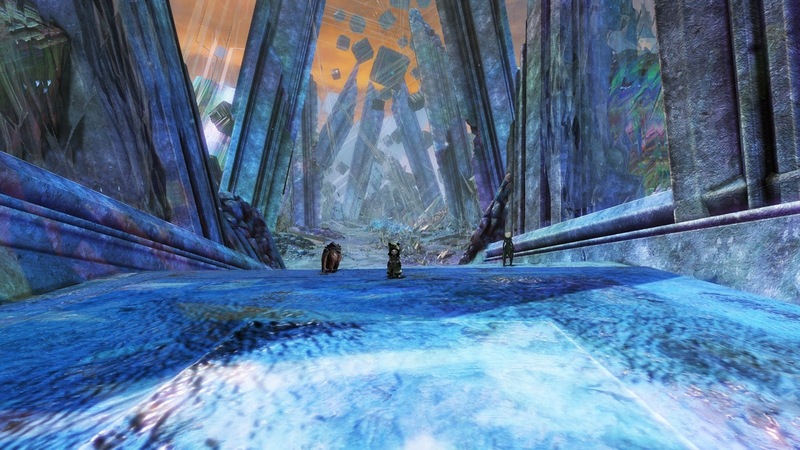 Cobalt Scar, gorgeous to look at, fascinating to explore, has a long, involving and very nearly coherent storyline. My Bruiser did all of it. It was both a pleasure and a revelation. Not only was the storyline as entertaining as I'd remembered but there turned out not only to be some parts that I'd forgotten but even some that I'd missed. At the conclusion of the zone storyline there's a segue into a Signature quest involving the long-running Ages End prophecy that underpins a number of expansions. I'd started that with my Berserker, back when Cobalt Scar was current content, but never finished it. When I started to hit content and cut scenes I was sure I'd never seen before, I had to log my Berserker in and check his completed quest log to try and figure out why. It transpires that he'd stopped at the point when the questline moves into an Advanced Solo dungeon. It had been simply too tough for him. He'd shelved it for later, then never gone back. Ongoing power creep has made deep, structural changes to the game. It's highly significant that my Bruiser didn't falter at the point my Berserker balked. The boss fights were harder in the instances toward the end, it's true. He did have to Feign Death and wait for me to look up strategies on the wiki once or twice. In the end, though, he finished the whole thing at the first attempt. Bildi! This is an important meeting for important people! Go away! Over the years, the many, many years, EQ2's deep storyline involving Gods, Dragons, Mad Scientists, Vampires and Elemental Forces has seeped into my subconscious. I know so much without knowing what I know. The effect is that the appearance of certain characters or references to certain events triggers an emotional response even if I'm not entirely sure why. The Ages End storyline, though I barely understand it and couldn't summarize even the main plot points if my life depended on it, always manages to wring some kind of reaction from me as it unfolds. The final movement of the Cobalt Scar sequence was no exception. I'm going to have to finish it now on my Berserker so I can see it from Freeport's perspective, my Bruiser being a quiche-eating Qeynosian. All of that put my Bruiser into the mid-90s (not unlike that quiche reference). I scratched my head a bit on where to go next but as it happened the game had its own ideas. On my way to visit Queen Antonia Bayle for a de-briefing session, no fewer than three NPCs stopped me in the streets of Qeynos to offer me lead-ins to Signature questlines I'd missed. That led to a confusing few minutes, where I visited Antonia three times in quick succession to talk about important events, some of which were already over even though they hadn't happened yet. MMORPGs are like that. It was nice to see her Palace from the inside, anyway. And of course I took a selfie next to the Queen! 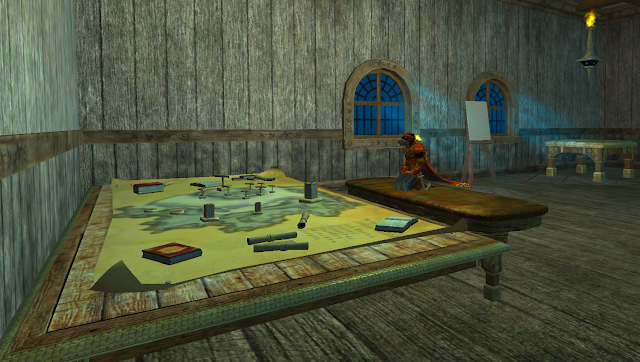 On his sporadic returns to EQ2, Wilhelm often expresses some confusion about where to level next. It can be a problem. Because of the way EQ2 has grown over a decade and a half, with expansions often overlapping in level range and between-expansion updates filling in the gaps, there's a huge variety of options available at most level ranges. Not only is there no specific place you should be at most levels, the aforementioned power creep means that if you just play normally you stand little to no chance of completing a whole zone before you outlevel it. The options don't really narrow very much until you hit 100, at which point they suddenly coalesce to a single point. That can feel like hitting a brick wall if you don't know what's happening. A couple of expansions back, Daybreak finally lost patience with one of the partiularly egregious, inured habits of bitter veterans. A cadre of players would spend the first few days of each expansion cycle grinding to the new level cap by soloing old dungeons, complaining bitterly all the while about how bored they were and how SoE (later DBG) made them do it. DBG fixed that by upping the experience needed for the ten levels from 101 to 110 by orders of magnitude, then attaching that xp to the quests in the new zones. From 101 onwards you can solo the old stuff for hour after hour and never see your xp bar move a nanometer. Say what you like about sirens; they do know how to decorate a grotto. My Bruiser is currently sitting in the middle of level 98. He cleaned up a few old quests, mainly for status, then he went to Tranquil Sea and did all the quests in the Isle of Refuge starting area. I already have another character running those at 100, though, so rather than burn myself out, repeating the same content, I took him to some dungeons where the mobs were green and blue. The xp there is okay but the draw once again is that this is stuff I have never seen before, even if I thought I had. It seems I never really explored The Hole, for example. There are a lot of dungeon instances in the Sentinel's Fate expansion and I thought that over the years I'd been through all of them. I was wrong. It is a shame to think that as we move forward we probably won't see this kind of diversity any more. Both the new design aesthetic and DBG's reduced resources mean that there's likely to be only one road ahead from now on. That's assuming there's a road at all. 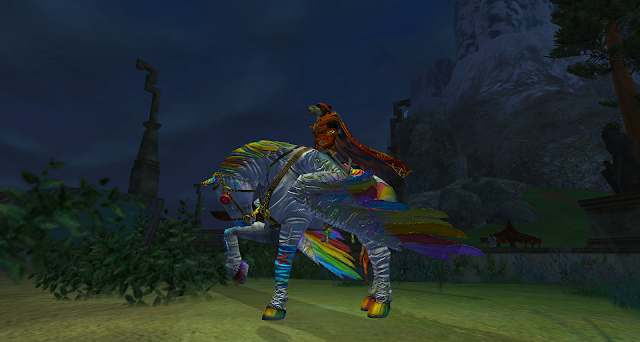 I think it's odds on that EQ2's seen its last expansion. If this extremely enjoyable last couple of weeks, running through old content, has taught me anything, though, it's that there's always something fresh to discover. EQ2 is just unfeasibly huge. 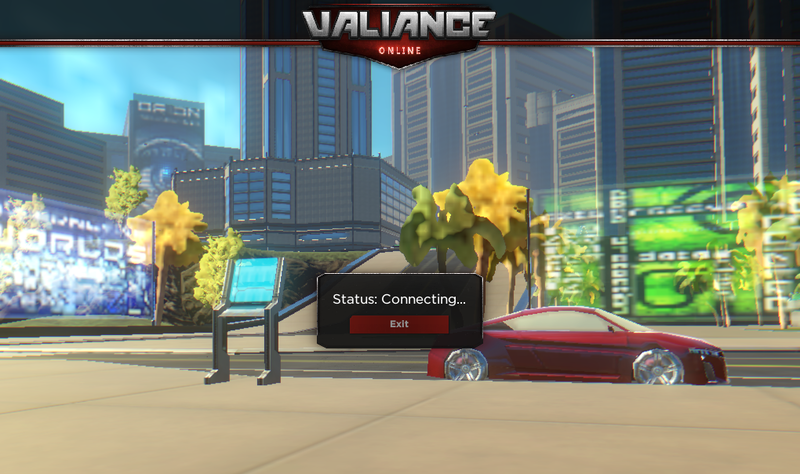 If someone can manage to keep a server up I plan to keep playing forever. Then again, what did I say about making plans? Every year, bloggers I follow post their plans. Things they want to do. Things they hope they'll do. Things they need to do. They set out a stall for a whole new approach to both gaming and blogging. They lay down rules about the games they'll play, how often and for how long. They imagine the new adventures they'll have as they seek to change patterns or break habits or somehow turn themselves into better, more rounded, more complete gamers. It's New Year, so naturally there's been a flurry of such posts but there are quite a few bloggers I can think of who share their detailed play-plans a lot more often than just once a year. Evidently, quite a lot of gamers like to have their days, weeks and months mapped out ahead of them. I don't. My gameplay is a lot more whim-based than that. Which is not to say I don't have a few vague plans and some firm expectations. 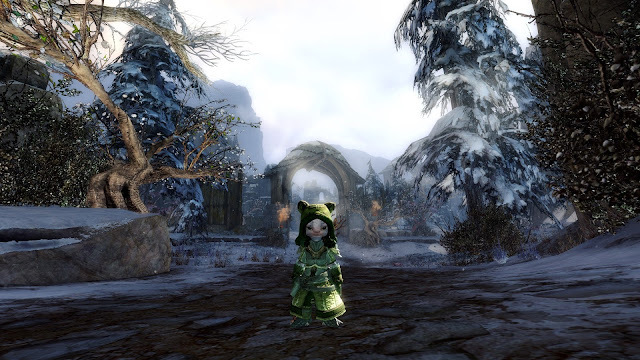 I know, for example, that I'll be doing my GW2 dailies, every day, on three accounts. I have a mental list of MMORPGs I'm not playing but haven't abandoned, meaning I have a theoretical intention to play them again at some point. I know there are new games or events or expansions in the works that I'll want to take a look at when they appear. It's not anything that I feel needs to be tabulated or timetabled, though. I just sit down of an evening or on my days off and let the mood of the moment drive my decisions. It's also pretty much how I write these posts, come to think of it. Now, please pay attention, Bildi. We don't want any repetitions of last time, do we? I still haven't got the ichor out of my cloak. I already leveled a Bruiser the hard way, through the advancing level caps as they changed, expansion by expansion, capping out at 90 before I changed servers. I'm in the middle of working through the excellent current expansion, Chaos Descending, with my solo-endgame-capable Berserker. I have two boosted, geared Level 100s waiting to be taken through the last ten levels. I have an unused Instant Level 110 boost sitting in my /claim window. And yet, that's what's been happening. 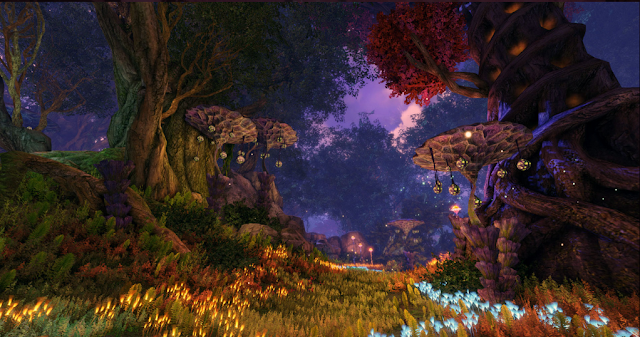 All the time I've been posting about Atlas and Ashes of Creation I've really been spending most of my time in EQ2, playing through old content and loving every minute. I kind of know how it started. It began when I spotted that unexplained 100% server XP boost all the way back in November. It's still on now. I still don't know why. 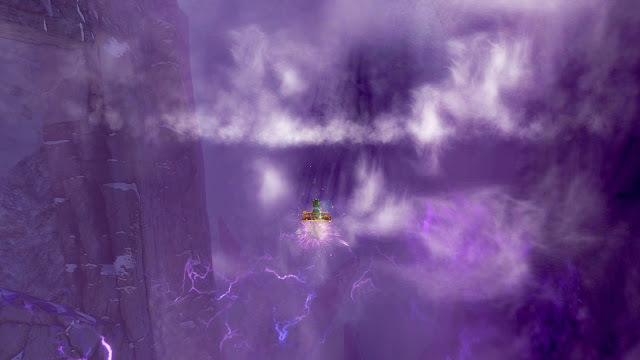 I knew at the time that I "ought" to use it to get my slacking Level 100s to the cap but that would have meant grinding through Plane of Magic twice more and I'm a tad burned out on that zone after a year of faction quests. Anyway, xp boosts always feel more spectacular on lower-level characters, where you can fly through a level in a matter of minutes. I had a look at the roster and the most likely candidate seemed to be the Bruiser, then in the very low 60s. Are you committing all this to memory like I asked you, Bildi? Because all I can hear is you humming that new song you wrote about treants. What is it with you and treants, anyway? As of last night he's just a few bubbles short of 97. I've played him most days since before Christmas, sometimes for long sessions lasting several hours. When I first logged him in he was in Tenebrous Tangle, the opening zone in the twelve-year old Kingdom of Sky expansion. I did a few quests there, then I took him into The Sanctum of the Scaleborn, an old favorite for level-grinding. For many years people would circumvent the unpleasant chore of playing through brand new content they'd never seen - and which they'd just paid for - by going to an old dungeon they'd already cleared a thousand times. They would then grind through that dungeon solo, over and over, while complaining how awful the game was and how empty and dull their lives had become. You can't do that any more. Daybreak staged an intervention. Last year or the year before they fixed things so that, when they increase the level cap, you have to go to the new expansion zones to level. They didn't do anything to stop you speeding through old content before you hit the current ten-level cap cycle, though! I don't think they could, really. Depending on how you look at it, the leveling game in EQ2 is either catastrophically broken or the best it's ever been. Having played since beta and experienced every variation, of which there have been many, I very much cleave to the latter interpretation. 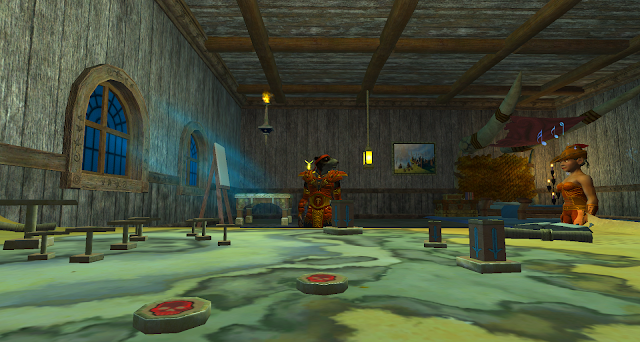 Honestly, leveling solo in EQ2 now is a joy. It's pure pleasure from end to end. It still has considerable granularity; if you go it totally alone, without a mercenary, using only quested gear, you can have a smoother, less frustrating version of the original experience. Yes, Bildi, I am sure we're "up to this". Just follow the plan and we'll be fine. No, it won't be like last time. Anyway, you got paid, didn't you? If you employ a mercenary, however, your sessions will feel like the very best kind of powerleveling. For a pittance many orders of magnitude smaller than a paid powerleveling partner would have asked back in the day, when players offered such services, your Mercenary will begin by one-shotting anything you point them at. What's more they'll keep at it for as long as you want, without complaining, patronising, chuntering on about their own problems, leaving you cowering in a corner while they take the dog for a walk or yelling at you for getting them killed when they overestimate their own abilities and pull the entire floor at once. As you progress your Merc will become slightly less godlike but not by much. Even in the 90s my Bruiser's partner, a Troubador (one of EQ2's several Bard classes), does considerably more damage than he does. It's not just about the Merc, though. There have been some general changes to both difficulty and rate of xp gain over the years that affect everything you do. These days there are account-based benefits, like the bonus to xp for every max level you have. I get a 60% bonus from that. And the Divine Stamina and Potency boosts that affect all characters on the account as soon as one character gets them. Then there are item boosts from things like the pre-order illusions. And that mysterious server bonus. And Vitality, which can be refreshed once a week with one of the Veteran Rewards, the Orb of Concentrated Memories. Not to mention the multiplicity of xp potions that pop out of various anniversary bags. So, your character is more powerful but also the mobs seem weaker. Many of them are. There have been several difficulty passes over the years, with mobs intended for groups being downgraded to solo status and whole zones and instances being re-assigned for solo or duo play. It's not just intentional downgrading that's weakened the wildlife. Playing through the mid-to-high level zones as I have been, I would say it's really not so much what has been changed that affects current difficulty as what hasn't. Where your characters have benefitted from any number of boosts and buffs, the mobs haven't gained at all. When I began my current climb up the level ladder, my Bruiser was completely untwinked. All he'd really ever done was a few holiday events and some low-level dungeons for fun. When I picked him up again he was dressed in whatever quest rewards and drops he'd happened upon. Many of them were way below his level. The mobs he was fighting, even the solo ones, all higher than him, should have been able to eat him alive but even when his Merc was engaged with another mob, the Bruiser was more than able to stand his ground. As levels flew by and better (level-approporiate) gear began to replace the old stuff, everything became easier still. In the old days I would grind levels very pleasurably in Sanctum of the Scaleborn and other dungeons, either in a duo with Mrs Bhagpuss or solo but mentored down. It wouldn't have been feasible to do it alone and at level. It still might not always be practical, wholly solo, in level-appropriate gear, without a Merc, but only because it would be too slow. It certainly would be possible, as in you wouldn't die, over and over. That didn't used to be the case. With the Merc it was a breeze. In a session I was high enough to think about where I'd like to go next. I opened the map and had a look at my options. In EQ2 they are many. Too many, some might say! Why is it always night-time when I arrive in Kylong? Oh well, look on the bright side...at least no-one can see what I'm riding. I really must look into getting a new mount. After a couple of hours in the claustrophobic halls of an underground dungeon I thought my Bruiser would appreciate the wind in his whiskers (Ratonga, of course). 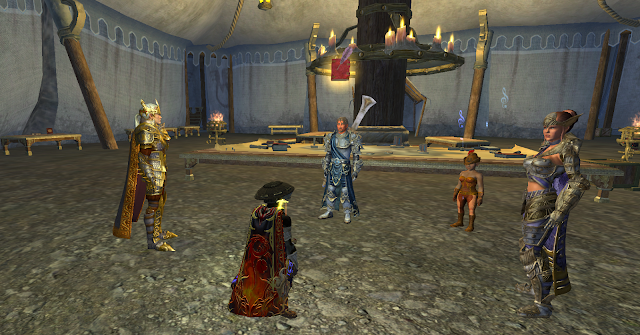 He was perhaps a level or two shy of the recommended starting level for Kunark but I was sure he'd cope. 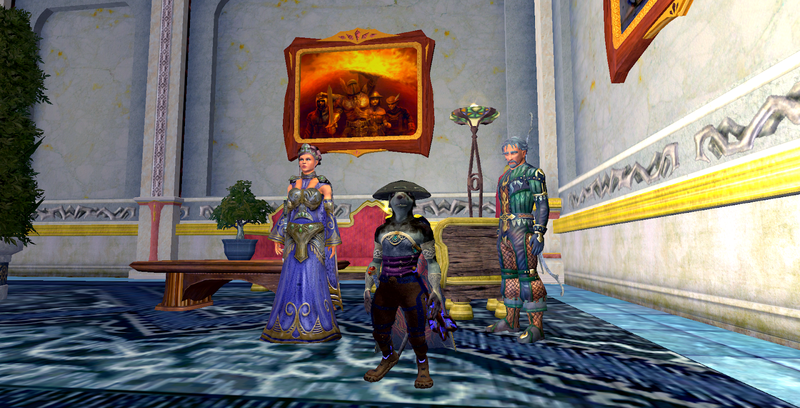 And that's how it came about that I've been playing mostly EQ2 over Christmas and the New Year. Inbetween, I had some fun in Atlas, scratched that new game itch. Looking ahead, while GW2 has been on the back burner, it should come to the boil tomorrow with the release of the next episode of the Living Story. 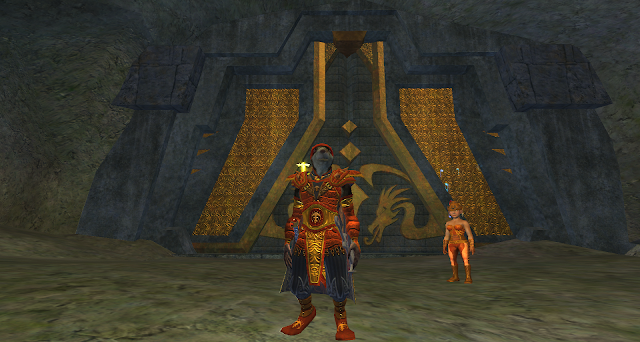 My focus, though, has been on Norrath, yet again. I wouldn't have expected to get such a fresh-feeling, new experience from a fifteen-year old MMORPG I've been playing for, well, for fifteen years. This is why I mostly don't plan my gaming and even when I do I often end up veering wildly off-course No plans I could think up could match the kind of serendipity inherent in the wildness of the games themselves. When I finish this post I'm going to go back and level up my Bruiser some more. 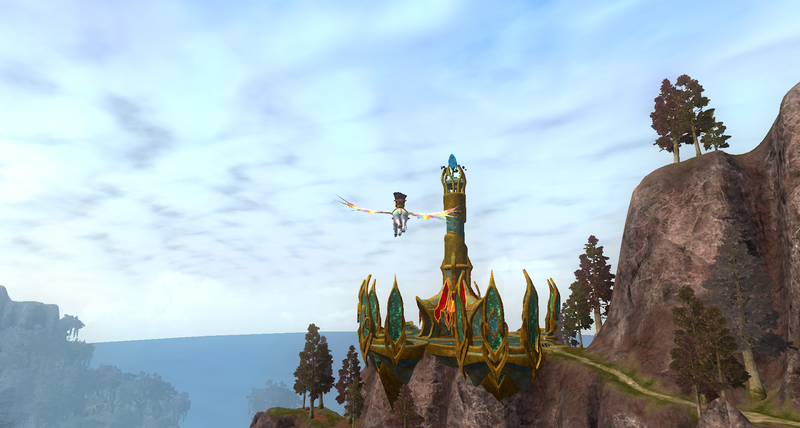 It's the most fun thing I can think of to do in MMORPGs just now. So much so that I might move on to some other characters afterwards. I'm not sure if that counts as a plan. And I'm going to write up some of my Bruiser's adventures here, because there's quite a lot more I have to say on that topic. I guess that's a plan, too. In fact, I had planned to go into detail about just what he's been up to in this post this morning. I even had the screenshots prepared. I had a whole lot of pertinent observations to share and some wise conclusions to draw from the experience, too. Well, I got sidetracked, didn't I? Sideswiped by serendipity or poor concentration skills. One or the other. So much for making plans!